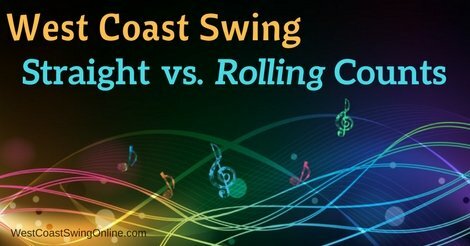 In west coast swing, there are three common ways to count music: straight count, rolling count, and swung count. This post will discuss straight vs. rolling counts; a follow-up post will take up the differences between rolling and swung counts. At a basic level, music is divided into beats. If you just marched through the song, you would be moving exactly on the beat. Many partner dances only move on the beat, at least in their basic patterns. A basic foxtrot—slow, slow, quick, quick—moves on the 1, 3, 5, and 6. Salsa moves on 1, 2, and 3, holding the 4 (hence the quick, quick, slow rhythm). Tango’s basic rhythm is slow, slow, quick, quick, slow, which translates to 1, 3, 5, 6, 7 if you’re counting in 4/4 time. The swing family of dances (and a couple of other dances, like hustle and zouk) move between the beats. That’s why we count a side pass as 1, 2, 3 & 4, 5 & 6. The “and” counts occur somewhere between the beats. The difference between straight count, rolling count, and swung count is where the & is put between the beats. The easiest way to divide the beat is to put the “and” directly in the middle of the beat. In straight count, the time between downbeat and & is the same as the time between & and the upbeat. As a result, most club music played for WCS should be counted in straight time. Examples of straight count songs include I Gotta Feeling by the Black Eyed Peas, Tik Tok by Ke$ha, and Blackout by Breathe Carolina. So, a rolling count for our side pass would be &a1 &a2 &a3 &a4 &a5 &a6 (with the bold and underlined elements being where the weight transfers happen). There’s a lot going on with the rolling count, but for now I want to focus on two changes between straight count and rolling count. First, even though both of them use the same word—”&”—the &s are in different places within the beat. The straight count & is exactly halfway between the beats, whereas the rolling count & is closer to the first beat of the pair. In conclusion, the goal of rolling count is to divide the beat up into uneven pieces so that the dance looks less like marching; as a result, the & moves earlier in time. Second, because the & is earlier in time, the rolling count rhythm doesn’t actually dance on &. Instead, it dances on the “a,” which is later than the & of straight count (the 2/3 mark, rather than halfway). Therefore, the reason we dance on the “a” will be the subject of a future post; the short answer is that dancing early feels tense and does weird things to the pulse of the dance, while dancing later creates a groovier feel and better sets up the pulse on the beat. Examples of rolling count songs include I Got the Blues by Brother Yusef and Blues Power by Albert King. If you listen to those songs closely, you can hear each of the pieces of the rolling count. Although rolling count is very common in the blues, it’s not a rule: B.B. King’s Better Not Look Down is a straight count song, while Alicia Keys’ How Come You Don’t Call Me is a contemporary song that is nonetheless rolling count.